The world’s oldest known mask eerily resembles our modern and ubiquitous “smiley face” — though this elder manages to strike a bit more pensive and thoughtful a pose. Pretty good for being nine thousand years old. All date to the same era, verified with microarchaeology techniques that included testing surface sediment and examining their crystalline structure and mineralogical composition under the microscope. What makes these masks, and not simply portraits? Small circular holes, neatly carved along the edge of many of these masks, seem handy for insertion of cordage to secure onto the head. And, scans and 3D models revealed that they would have been comfortable worn as masks. They are proportional to and follow the contours of the human face, with large eye holes affording a wide angle view. The scans also revealed that some masks look to be fashioned after the skulls of individuals. 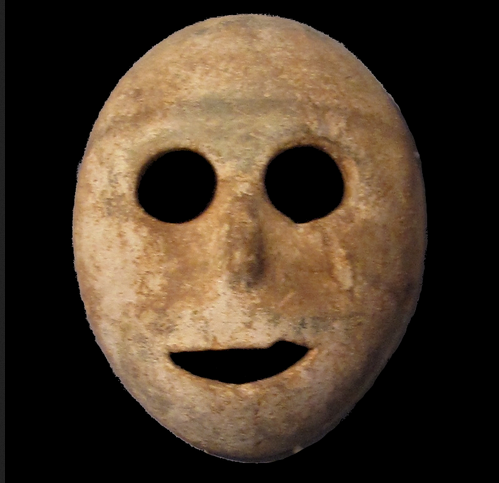 And weighing in at 2.2 to 4.4 pounds, these masks of chalk and limestone are actually much lighter than many of the masks worn ceremonially by indigenous cultures today, notes Debby Hershman, curator of Jerusalem’s Israel Museum’s Prehistoric Cultures Department. 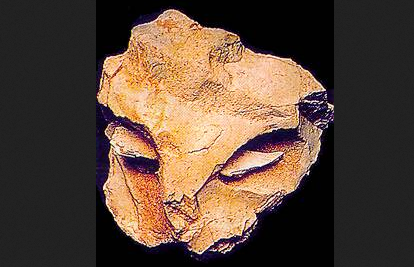 She has spent the last decade studying these masks, part of the only fifteen known from the Neolithic era. To what purpose were these many masks, so carefully fashioned? The prevailing theory is that they were used in part to lay claim to land rights. The advent of agriculture allowed migratory tribes to settle down and establish a permanent presence, and identify with one place. In the days before writing, invoking one’s genealogical lineage was one of the few ways to justify and convey rights of ownership. In ritual, one can animate the masks of the deceased and momentarily bring them to life to speak on one’s behalf. But it wasn’t all just business. One of the caves where masks were found, known as Nahal Hemar, looks like a storage unit for ritual gear. Among the thousands of objects found were embroidered textiles that might have been ritual wear, rope baskets, wooden beads, shells, flint tools, bone figurines, and human skulls decorated with a kind of molded asphalt. Fragments of stone masks had clumps of hair still attached, as beards and mustaches, which led to the conjecture that some of holes along the masks’ edge might have given them flowing hair. While these are the oldest known masks, we know the first making of masks reaches much further back in time. We see masks depicted on painted cave walls of twenty and thirsty thousand years ago. Long before the invention of ceramics, masks of animal skins and bone, plant fiber, cord, wood, and feathers, materials that end themselves more readily to the task, are long gone. We can imagine the long legacy of masks lost to time, which must reach even further back to include the Neanderthals. For here is a 35,000 year-old flintstone artifact found at Roche-Cotard in France, a Neanderthal site. Note the perfect and intentional positioning of the bone splinter — pushed in forcibly — that creates the eyes. The tip of the nose was shortened by removal of a flake, perhaps the cheekbones as well. That this face looks like a cross between a feline and human adds to its mystery. All this elevates it into one of the earliest portraits, all the more exceptional in that it’s maker was a member of a culture not previously known to produce art. Art lies deep within the entire human family. It just seems to be in our bones.